We are offering a 10% discount for online appointments booked in on Mondays. 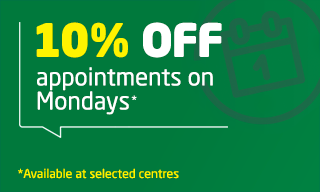 The discount will be applied automatically after selecting a Monday appointment online (once you select your Centre and appointment time). This offer is valid on purchases made in a single transaction online. Terms and Conditions for this offer can be found below. ATS Euromaster’s online Retail Customers will receive a discount* when booking Monday appointments online at www.atseuromaster.co.uk for a single vehicle in a single transaction. Offer is only available on Monday appointments, between the hours of 8.30am to 5.30pm only. Available at selected Centres only. *10% off your purchase value (including VAT where applicable). This offer is available to Retail customers purchasing products and/or services online only. It is not available to Customers purchasing in Centre, or Business or Account Customers. The offer is available to customers purchasing eligible products and services from the ATS Euromaster online shop only (www.atseuromaster.co.uk). All products and services purchased under this offer must be fitted or completed by ATS Euromaster at an ATS Euromaster Service Centre, the fitting appointment should be made at time of purchase and this discount is applicable only for appointments booked on a Monday between 8.30am and 5.30pm . This offer may not be used in conjunction with any other discount or offer for the same product or service. Offers are subject to availability. In some cases the Monday time slots may be fully booked and/or unavailable. In this instance ATS Euromaster does not have to honour this promotion discount. The Monday time slots, and the discount associated are available on a first come first serve basis.